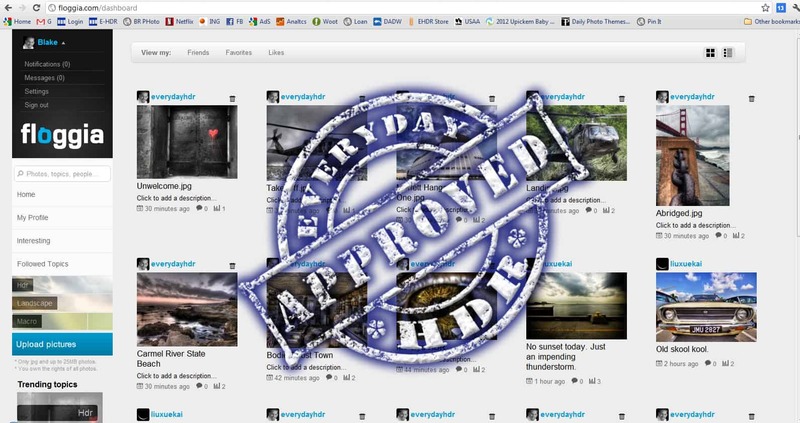 I was recently invited to a new photography social media site called Floggia by Miguel Kudry. It is an interesting photography social network that is extremely easy to navigate and upload to. Both of these aspects are instrumental to someone like me. Someone who has Adult A.D.D when it comes to the whole social network on the web. There are so many places to share your work and everyone of them are so entirely different. So what does Floggia add to the social media world for Photographers? The most important aspect of Floggia, all of the rights to your images remain with you. It is stated several times, not only in the guidelines but the reminder is their with every upload. Floggia is EXTREMELY simple to upload to, and incredibly fast! I selected 9 images to upload, they were in my personal profile within 20 seconds. I had them tagged in another 20 seconds and I started following 3 topics in less than a minute. As one who does not have much time for social media sites, Floggia does not leave much room for excuses! Floggia not only allows you to follow individual photographers, it allows you to follow topics as well. As you tag your photos they go into a pool of others with the same tag. This may not seem very new at all, but Floggia does an awesome job of visually displaying the photos coming through the stream for each topic. There is a list view and a grid view. I prefer the grid view with smaller thumbnails. I am currently following Hdr, Landscape, and Macro, my 3 favorite aspects of photography! It is simple and clean. It is not convoluted with image vomit. Floggia adds enough space between the images to allow your eyes a break from one image to the next. It is the little things in life, I love the attention to detail Floggia adds by throwing the EXIF data next to the shot being viewed. Floggia allows you to not only favorite images, but like them as well. For those who like to differentiate between their likes and loves! An awesome feature for those who like something, but don’t necessarily like it enough to call it a favorite! Of course, like many social media sites, you can directly like images and topics to Facebook as well. The most impressive aspect of Floggia, it was created by a 19 year old student, web entrepreneur. Awesome job Miguel. So far I am loving my taste of Floggia and can only hope it stands the test of time in the competitive world of social media. There are many refreshing aspects to Floggia that will benefit any Photographer looking to find a new social media site. I highly recommend sharing your work with others on Floggia.com. After all, one cannot have too many options to expose their work can they?